Hi great to see you again.! I've been busy this week as I worked more this week than I normally do and just coloring images. trying to get some cards made, I'm pretty happy with how the couple of cards are that I've been working on. This card I decided to pick out the paper first and then color the image to match. I don't do that very often. I love the colors of this card. I used a new image from Miss Daisy Stamps called Raggedy Girl Daisy Mae. Here are a few of the sentiments that you get with the image as well. 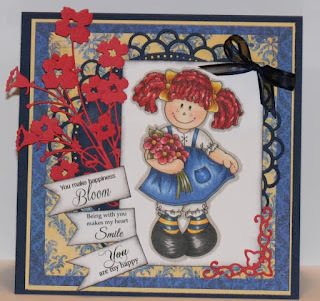 She is wonderful Charlene..gorgeous colouring and papers with the little tags and flowers..fabulous. Love your gorgeous Raggedy Girl Daisy Mae card, Charlene. It's everything beautiful and sweet. Lovely job. Makes me smile! Your designing and colourings are fabulous.